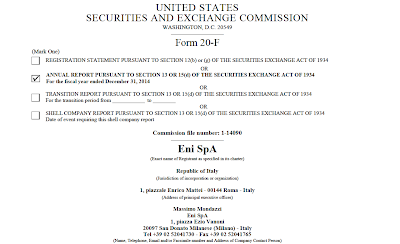 Anche per il 2014 l’ENI ha dovuto rilasciare il suo 20F Form alla SEC, la Security and Exchange Commission of the United States of America. E’ un documento annuale che contiene tutte le informazioni che possono essere utili agli investitori che cosi possono decidere se comprare, vendere o mantere le azioni sui mercati USA. L’ENI e’ quotata a Wall Street e cosi anche lei deve presentare il suo 20F. Per l’anno che e’ terminato il 31 Dicembre 2014, ci sono circa 400 pagine. Da pagina 282 a pagina 292, fitte fitte, ci sono i cosiddetti “Criminal proceedings”, “Administrative Proceedings”, “Tax Proceedings”, “Court Inquries”, “Antitrust proceedings”. A suo tempo l’ENI mi ha fatto sapere che non apprezza che io traduca in italiano quello che c’e’ scritto su questi 20F, con tanto di carte firmate e intestate da una mezza dozzina di avvocati. Cosi, semplicemente ecco qui, non tradotta, una lista di “proceedings” vari in cui il principale ente petrolifero d’Italia e’ coinvolto. C’e’ tutto il mondo. Una parte di me e' orgogliosa del fatto che non ci sia la contrada Feudo, Ortona, Abruzzo e per la quale ho messo su una delle cose piu' belle della mia vita. Perche' faccio questo? Perche' l'ENI voleva venire nei campi della mia infanzia a spiantare le vigne per impiantare pozzi di petrolio e tubature e per costruire una raffineria con quattordici punti di emissione, proprio a contrada Feudo, Ortona. Mi si spezza il cuore a leggere tutto il petrol-schifo dell'ambiente e della democrazia lucana e nei palazzi di Roma. E spero che queste cose siano di monito per tutte le comunita' che sono ancora in tempo. investigazioni da parte dei giudici, in altre sono cause contro di lei. Sono sicura che come a Viggiano sono innocenti di tutto, che sono tutte fatalita’ e invenzioni dei PM in tutto il mondo. ENI is the defendant in a number of civil actions and administrative proceedings arising in the ordinary course of business. In addition to existing provisions accrued as of December 31, 2014 to account for ongoing proceedings, it is possible that in future years ENI may incur significant losses in addition to the amounts already accrued in connection with pending legal proceedings due to: (i) uncertainty regarding the final outcome of each proceeding; (ii) the occurrence of new developments that management could not take into consideration when evaluating the likely outcome of each proceeding in order to accrue the risk provisions as of the date of the latest financial statements; (iii) the emergence of new evidence and information; and (iv) underestimation of probable future losses due to the circumstance that they are often inherently difficult to estimate. Certain legal proceedings where ENI or its subsidiaries or its officers are parties involve the alleged breach of anti-corruption laws and regulations and ethical misconduct. 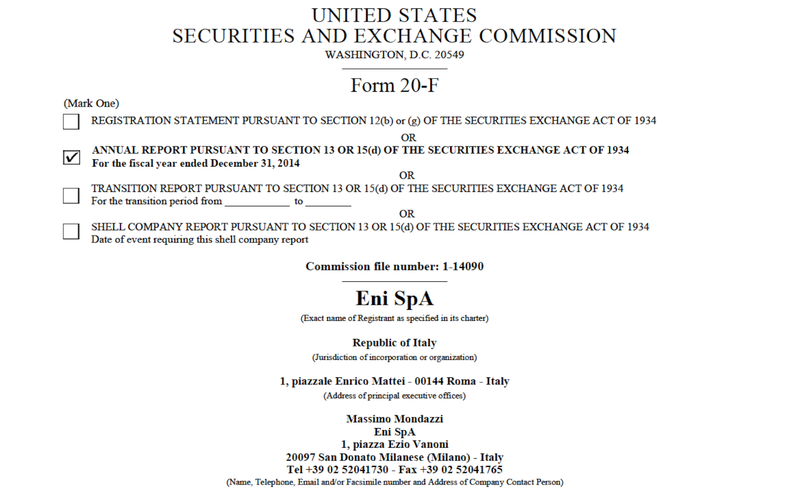 Ethical misconduct and non-compliance with applicable laws and regulations, including non-compliance with anti-bribery and anti-corruption laws, by ENI, its partners, agents or others that act on the Group’s behalf, could expose ENI and its employees to criminal and civil penalties and could be damaging to ENI’s reputation and shareholder value. (i) Fatal accident Truck Center Molfetta - Prosecuting body: Public Prosecutor of Trani. Public Prosecutor has yet to be scheduled. (ii) Syndial SpA (company incorporating EniChem Agricoltura SpA - Agricoltura SpA in liquidation - EniChem Augusta Industriale Srl - Fosfotec Srl) - Proceeding about the industrial site of Crotone. A criminal proceeding is pending before the Public Prosecutor of Crotone relating to allegations of environmental disaster, poisoning of substances used in the food chain and omitted clean-up due to the activity at a landfill site which was taken over by Eni’s subsidiary in 1991 following the divestment of an industrial complex by Montedison (now Edison SpA). The landfill site had been filled with industrial waste from Montedison activities till 1989 and then no additional waste was discharged there. Eni’s subsidiary carried out the clean-up of the landfill in 1999 through 2000. The defendants are certain managers at Eni’s subsidiaries which have owned and managed the landfill since 1991. An assessment was performed by independent consultants and the proceeding is still pending. (iii) Eni SpA - Gas & Power Division - Industrial site of Praia a Mare. measures on the workplace. Following a settlement agreement with Eni, Marzotto SpA entered settlement agreements with all plaintiffs, except for the local administrations. On December 19, 2014, the Tribunal issued an acquittal sentence for all defendants, as the indictment was found groundless. The next step will be the filing of the outcomes of the judgment. (iv) Syndial SpA and Versalis SpA - Porto Torres dock - Prosecuting body: Public Prosecutor of Sassari. In July 2012, the Judge for the Preliminary Hearing, following a request of the Public Prosecutor of Sassari, requested the performance of a probationary evidence relating to the functioning of the hydraulic barrier of Porto Torres site (ran by Syndial SpA) and its capacity to avoid the dispersion of contamination released by the site in the near portion of sea. Syndial SpA and Versalis SpA have been notified that its chief executive officers and other managers are being investigated. The Public Prosecutor of the Municipality of Sassari requested that the above mentioned individuals would stand trial. The Judge for preliminary investigation authorized that the two Eni’s subsidiaries would be arraigned to compensate any possible damage in connection with the proceeding. The proceeding is still pending. (v) Syndial SpA - Public Prosecutor of Gela. the medical appraisal could be directly linked to the exposure to emissions related to the production of chlorine and caustic soda. The consultants also found that production activities were in compliance with applicable laws and regulations on health and safety. The outcomes of the assessment are being assessed by the Public Prosecutor. Prosecuting body: Public Prosecutor of Castrovillari. Certain areas owned by Eni in the Municipalities of Cassano allo Jonio and Cerchiara di Calabria have been seized by the Judicial Authority pending an investigation about an alleged improper handling of industrial waste from the processing of zinc ferrites at the industrial site of Pertusola Sud, alleged illegally stored. The circumstances under investigation are the same considered in a criminal action for alleged omitted clean-up which was concluded in 2008 without any negative outcome on part of Eni’s employees. Eni’s subsidiary Syndial SpA has removed any waste materials from the landfills and Syndial entered into an agreement with the Municipality of Cerchiara to settle all damages caused by the unauthorized waste disposal in the landfills to the territory of the Municipality. The Municipality of Cerchiara renounced all claims in relation to the circumstances investigated in the criminal proceeding. Eni’s subsidiary has also arranged a similar transaction with the Municipality of Cassano. Syndial is performing clean-up and remediation activities. The criminal proceeding is still pending. (vii) Syndial SpA - Proceeding on the asbestos at the Ravenna site. A criminal proceeding is pending before the Tribunal of Ravenna about the crimes of culpable manslaughter, injuries and environmental disaster which would have been allegedly committed by former Syndial employees at the site of Ravenna. The site was taken over by Syndial following a number of corporate mergers and acquisitions. The alleged crimes date back to 1991. In the proceeding there are 75 affected victims. The plaintiffs include relatives of the alleged victims and various local administrations and other institutional bodies, including local trade unions. The advocacy of Syndial claimed the statute of limitation about the instance of environmental disaster for certain instances of diseases and deaths. On February 6, 2014 the Judge for the Preliminary Hearing at Ravenna decided that all defendants would stand trial and ascertained the statute of limitation only with reference to certain instances of crime of culpable injury. The proceeding is entering the hearing phase. 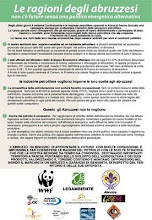 (i) Syndial SpA (former EniChem SpA) - Summon for alleged environmental damage caused by DDT pollution in the Lake Maggiore - Prosecuting body: Ministry of the Environment. against the above mentioned sentence, and consequently the proceeding continued before a second degree court. In the hearing of June 15, 2012, before the Second Degree Court of Turin, the Minister of the Environment, formalized trough the Board of State Lawyers its decision to not enforce the sentence until a final verdict on the matter is reached. The Second Degree Court requested Syndial to stand as defendant and then requested a technical appraisal of the matter. This technical appraisal was favorable to Syndial; however such outcome was questioned by the Board of State Lawyers. The Appeal court of Turin summoned the parties and indicated in the subpoena an interpretation of the environmental damage which seemed to mirror the position of the Eni’s subsidiary. previous environmental conditions at the Avenza site and payment of environmental damage. The Municipality of Carrara commenced an action before the Court of Genoa requesting Syndial SpA to remediate and restore previous environmental conditions at the Avenza site and the payment of environmental damage (amounting to euro 139 million), further damages of various types (e.g. damage to the natural beauty of this site) amounting to euro 80 million, as well as damages relating to loss of profit and property amounting to approximately euro 16 million. This request is related to an accident that occurred in 1984, as a consequence of which EniChem Agricoltura SpA (later merged into Syndial SpA), at the time owner of the site, carried out safety and remediation works. The Ministry for the Environment joined the action and requested environmental damage payment – from a minimum of euro 53.5 million to a maximum of euro 93.3 million – to be broken down among the various companies that ran the plant in the past. With a sentence of March 2008, the Court of Genoa rejected all claims made by the Municipality of Carrara and the Ministry for the Environment. The Second Instance Court also confirmed the decision issued in the first judgment and rejected all the claims made by the plaintiffs. The Ministry for the Environment filed an appeal before a third instance court on the belief that Syndial is to be held responsible for the environmental damage as the Eni subsidiary took over the site from the previous owners assuming all existing liabilities; it was responsible for managing the plant and inadequately remediating the site after the occurrence of an incident in 1984 and for omitted clean-up. Syndial established itself as defendant. (iii) Ministry for the Environment - Augusta harbor. Syndial and Eni Refining & Marketing Division. Pollution has been detected in this area primarily due to a high mercury concentration which is allegedly attributed to the industrial activity of the Priolo petrochemical site. The above mentioned companies opposed said administrative actions, objecting in particular to the way in which remediation works have been designed and modes whereby information on pollutants concentration has been gathered. A number of administrative proceedings were started on this matter, which were reunified before the Regional Administrative Court of Catania. In October 2012, said Court ruled in favor of Eni’s subsidiaries against the Ministry prescriptions about the removal of pollutants and the construction of a physical barrier. The proceeding is still pending. (iv) Claim for preventive technical inquiry - Court of Gela. and sentenced the Eni’s subsidiary to compensate for the environmental damage relating to the site of Cengio. The plaintiffs accused Syndial of negligence in performing the clean-up and remediation of the site. On the contrary, Syndial believes they have executed the clean-up work properly and efficiently in accordance with the framework agreement signed with the involved administrations including the Ministry of the Environment in 2000. On February 6, 2013, a Court in Genoa ruled the resumption of the proceeding and established a technical appraisal to verify the existence of the environmental damage. Following failed attempts to define a settlement agreement of the matter among the involved parties, the Judge resumed the trial. (vi) Syndial SpA and Versalis SpA - Porto Torres - Prosecuting body: Public Prosecutor of Sassari. statute of limitations. The Public Prosecutor filed an appeal before a Third Instance Court. 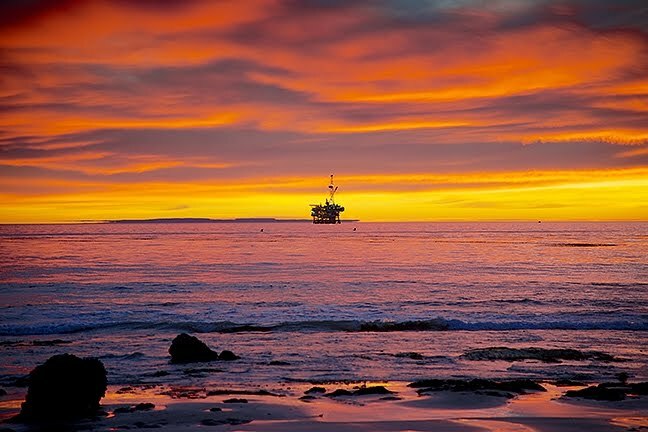 of civil claims against the Consortium developing the Kashagan field. These proceedings allege to certain emissions associated with gas flaring occurring during commissioning have resulted in infringements of environmental laws and environmental damages. The aggregate value of the civil claims is approximately $730 million (KZT 134 billion), of which Eni’s share would be approximately $123 million (KZT 22.5 billion). The Kashagan project’s consortium disputes these allegations. In 2014, the Consortium paid part of the claim amounting to $55 million (KZT 8.5 billion), $9 million being Eni’s share (KZT 1.4 billion) and commenced a legal dispute before a Kazakh court. Also considering a settlement agreement defined between the Consortium and the Kazakh Republic in December 2014, the Consortium is expecting that the amount of the claim will be significantly reduced and will not be higher than the amount already paid in 2014. 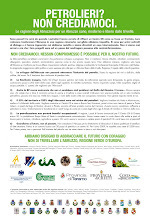 (viii) Syndial SpA and Versalis SpA - Summon for alleged environmental damage caused by illegal waste disposal in the municipality of Melilli (Sicily). In May 2014, the Municipality of Melilli summoned Eni’s subsidiaries Syndial, Versalis and SMA.RI Srl for the environmental damage allegedly caused by carrying out illegal waste disposal activities and unauthorized landfill. In particular, the arraignment concerns the responsibilities of Syndial and Versalis for the production of waste, acting in quality of commissioners, because the source of the dangerous waste (in particular, the waste with high mercury concentration and railway sleepers no longer in use) would have been allegedly traced back to the Priolo and Gela industrial sites that are managed by the above mentioned Eni’s subsidiaries. This proceeding is part of a larger criminal procedure which took place in 2001-2003 with regard to the so-called “the Red Sea case”. Such waste would have been illegally disposed at the SMA.RI’s unauthorized landfill (this landfill is located about 2 kilometers from the town of Melilli). The damage is estimated at euro 500 million or another amount which will be defined during the trial. The proceeding is still pending. client company Société du Terminal Méthanier Fos Cavaou (now FOSMAX LNG) and the contractor STS – a French consortium participated by Saipem SA (50%), Technimont SpA (49%) and Sofregaz SA (1%) – is pending. The memorandum filed by FOSMAX LNG supporting the arbitration proceeding claimed the payment of euro 264 million for damage payment, delay penalties and costs incurred for the termination of the works. Approximately euro 142 million of the total amount requested related to loss of profit, which is an item that cannot be compensated based on the existing contractual provisions with the exception of fraudulent and serious culpable behavior. STS filed counterclaim for a total amount of approximately euro 338 million as damage repayment due to the alleged F-88 excessive interference of FOSMAX LNG in the execution of the works and payment of extra works not recognized by the client. Both parties filed their memoranda. The arbitrators issued a final ruling on February 13, 2015 and established that FOSMAX LNG would pay an amount of euro 69.8 million to the STS consortium, including interest accrued over the period. Saipem’s share of the award is 50%. Eni and Eni Adfin, as Eni agent for the receivables collection, in the year previous to the insolvency declaration from November 30, 2003 to November 29, 2004, for a total estimated amount of euro 46 million plus interest. Eni and Eni Adfin were admitted as defendants. After the conclusion of the investigation, a court ruled against the claims made by the commissioners of the reorganization procedures. The relevant ruling was filed on March 1, 2012. The commissioners filed a counterclaim against the first degree sentence. (iii) Reorganization procedure of Alitalia Linee Aeree Italiane SpA under extraordinary administration. marketplace estimated at euro 131 million. An alternative assessment of the overall damage made by Alitalia stands at euro 395 million of which euro 334 million of higher purchase costs for jet fuel and euro 61 million of lower profitability due to the reduced competitive position on the marketplace. The proceeding of first instance is at a preliminary stage, as a number of pre-trial issues have caused a substantial delay. (i) Investigation by the Italian Antitrust about Eni’s determination of Italian market share of the Italian gas wholesale market. On August 1, 2014, the Italian Antitrust commenced an investigation to review Eni’s determination about its share of Italian gas wholesaler market. This market share must comply with certain limits set by the Italian Law Decree No. 130/2010 and the relevant determination was filed with the Antitrust in May 2014. In case Eni filed an unfair determination of the market share it might be fined. In addition, in case Eni’s market share in the Italian wholesaler gas sector exceeds the regulatory thresholds, the Italian Antitrust might open a competitive procedure whereby the Company is obliged to dispose of certain gas volumes (the so-called gas release) in accordance with terms and conditions established by the Italian Ministry for Economic Development and the Italian Authority for Electricity Gas and Water. (ii) Consob decision No. 18949 of June 18, 2014. With decision No. 18949 of June 14, 2014 the Italian commission for securities and exchange (Consob) fined Eni’s subsidiary Saipem by an amount of euro 80,000 in connection with alleged delay in issuing the profit warning which was disseminated by Saipem on January 29, 2013. 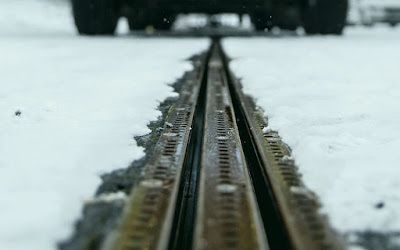 A second degree court in Milan confirmed Consob decision. Saipem is planning to file recourse before a third degree court. 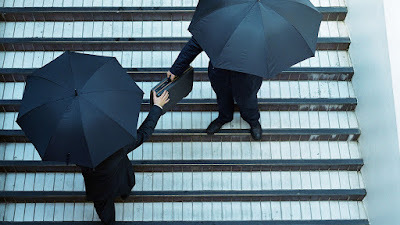 In connection with those allegations of delay in issuing a profit warning, certain shareholders and former shareholders expressed their intention to file a complaint seeking possible damages. Saipem believes that those claims are groundless. substantially confirmed the first-degree judgment except for the fact that it ascertained the statute of limitation with regard to certain defendants. An appeal is still pending before a third degree court. 2008. Eni holds a 43% participation in Saipem. In connection with the sale of Snamprogetti to Saipem, Eni agreed to indemnify Saipem for a variety of matters, including potential losses and charges resulting from the investigations into the TSKJ matter referred to below, even in relation to Snamprogetti subsidiaries. In recent years the proceeding was settled with the U.S. Authorities and certain Nigerian Authorities, which had been investing into the matter. The proceedings in the United States: following an investigation that lasted several years, in 2010 the Department of Justice and the SEC entered into settlements with each of the TSKJ Consortium members. In particular, in July 2010, Snamprogetti Netherlands BV entered into a deferred prosecution agreement with the DoJ, consented to the filing of criminal information, and agreed to pay a fine of $240 million. In addition, Snamprogetti Netherlands BV and Eni reached an agreement with the SEC to resolve the investigation and jointly agreed to pay disgorgement to the SEC of $125 million. All amounts due to the U.S. Authorities were paid by Eni in accordance with the indemnity granted by Eni in connection with its sale of Snamprogetti to Saipem. Following the two-year period set out in the deferred prosecution agreement, in September 2012, the DoJ dismissed the criminal information filed against Snamprogetti Netherlands BV, thereby dismissing the criminal proceeding against Snamprogetti Netherlands BV. 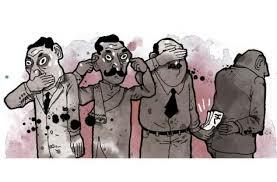 The proceedings in Italy: the events under investigation covered the period since 1994 and also concerned the period of time subsequent to the June 8, 2001, enactment of Italian Legislative Decree No. 231 concerning the liability of legal entities. The proceeding set by the Public Prosecutor of Milan investigated Eni SpA and Saipem SpA for liability of legal entities arising from offences involving alleged international corruption charged to former managers of Snamprogetti SpA. The Public Prosecutor of Milan requested Eni SpA and Saipem SpA to be debarred from activities involving – directly or indirectly – any agreement with the Nigerian National Petroleum Corp and its subsidiaries. Subsequently, the Public Prosecutor of Milan, with respect to the guarantee payment amounting to euro 24,530,580 even in the interest of Saipem SpA, renounced to contest the decision of rejection of precautionary measures of disqualification for Eni SpA and Saipem SpA. The charged crimes involved alleged corruptive events that have occurred in Nigeria after July 31, 2004. It is also stated the aggravating circumstance that Snamprogetti SpA reported a relevant profit (estimated at approximately $65 million). The Public Prosecutor requested five former employees of Snamprogetti SpA (now Saipem) and Saipem SpA (as legal entity incorporating Snamprogetti) to stand trial. In the course of the proceeding, the Court dismissed the case with respect to the position of the individuals who were acting as defendants for the expiration of the statute of limitations while the proceeding continued for Saipem SpA. Afterwards, the Court condemned Saipem SpA to pay a fine amounting to euro 600,000 and the disgorgement of the guarantee payment of euro 24,530,580, made by Snamprogetti Netherlands BV. Saipem filed an appeal against the sentence issued by the First Instance Court. The Appeal Court confirmed the first degree sentence on February 19, 2015. The Eni’s subsidiary is planning to file recourse with a third degree court. Eni accrued a provision in respect to this proceeding. (iii) Algeria - Corruption investigation. current exchange rates. Those bank accounts related to two ongoing projects in Algeria. In 2012, a notice of investigation was served to Saipem Contracting Algérie SpA. The company is alleged to have taken advantage of the Authority or influence of representatives of a government owned industrial and trading company in order to inflate prices in relation to a contract (GK3) awarded by said company. In January 2013, the Judicial Authority in Algeria ordered Saipem’s Algerian subsidiary to stand trial and reaffirmed the blockage of the above mentioned bank accounts. Saipem Contracting Algérie SpA has lodged an appeal against this decision before the Supreme Court which reaffirmed the blockage of the bank accounts. The proceeding started on March 15, 2015 and should be concluded in the course of 2015. Furthermore, also the parent company Saipem is being investigated by the Judicial Authority in Algeria for alleged corrupt payments (the so-called “Sonatrach 2” investigation). with judgment upon the merits due to the lack of serious evidence against Eni, accepting the defense arguments for which Eni suffered severe damages as a consequence of poor performances of some suppliers involved in the Kashagan project. In addition, the Court declared the lack of precautionary requirements considering the reorganization of the activities in Kazakhstan and taking into account of the initiatives of internal audit and control promptly adopted by Eni. The Public Prosecutor’s office did not appeal against the sentence of the Re-examination F-92 Court. Also based on this decision, on March 13, 2014, the Eni legal team requested to the Public Prosecutor to dismiss the proceeding. Eni’s former CEO. From the available documents, it was deduced that such Eni’s officers and former officers are under investigation by the Italian Public Prosecutor. During a hearing before a British court, Eni and its current executive officers gave evidence of their non-involvement in this matter regarding the seized bank account. Following the hearing, the Court issued a variation order regarding certain formal issues and reaffirmed its ruling. No. 7320/14 RGNR the Italian Public Prosecutor in Rome). search was conducted at the office of the former chief operating officer of Eni’s Refining & Marketing Division as ordered by the Rome’s Public Prosecutor. The motivations of the search are the same as the above mentioned proceeding as the ongoing investigations also relates to a period of time when he was in charge of that Eni’s Division. On March 5, 2015, the Prosecutor of Rome ordered a search at all the storage sites of Eni’s network in Italy as part of the same proceeding. The search was intended to verify the existence of fraudulent practices aimed at tampering with measuring systems functional to the tax compliance of excise duties in relation to fuel handling at the storage sites. territorial waters in the Adriatic Sea. 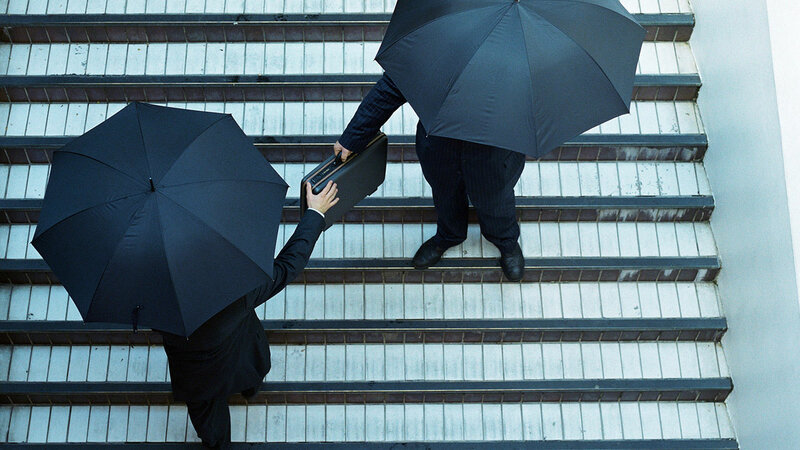 counterclaim before a third degree court. Similar formal assessments related to Eni oil and gas offshore platforms were presented by the Municipalities of Pedaso, Cupra Marittima and also from 2009 the Gela Municipality. (ii) Refund of tax surcharge as provided for by Article 3 of the Law No. 7 enacted on February 6, 2009.
by Eni for the year 2009. (i) Eni Angola Production BV. of the Petroleum Income Tax that was made by Eni Angola Production BV as partner of the Cabinda concession. The company paid the higher taxes under contestation for the years 2002-2006, requiring the recognition of its position for subsequent years and, accordingly, filed an appeal against this decision. The judgment is still pending before the Supreme Court. Eni accrued a provision with respect to this proceeding. (ii) Eni’s subsidiary in Indonesia. A tax proceeding is pending against Eni’s subsidiary Lasmo Sanga Sanga Ltd as the Tax Administration of Indonesia has questioned the application of a tax rate of 10% on the profit earned by the local branch. Eni’s subsidiary, which is resident in the United Kingdom for tax purposes, believes that the 10% tax rate is warranted by the current treaty for the avoidance of double taxation. On the contrary, the Tax Administration of Indonesia has claimed the application of the local tax rate of 20%. The greater taxes due in F-94 accordance to the latter rate have been disbursed amounting to $148 million including interest expense. Eni’s subsidiary has filed an appeal to the relevant tax authorities and accrued a provision with respect of this proceeding. (i) Inquiries in relation to alleged anti competitive agreements in the area of elastomers. On November 29, 2006, the European Commission claimed alleged anti competitive agreements in the field of BR and ESBR elastomers and fined Eni and its subsidiary Versalis SpA (former Polimeri Europa SpA) for an amount of euro 272.25 million. Eni and its subsidiary filed claims against this decision before the European Court of First Instance which reduced the above mentioned fine to the amount of euro 181.5 million. This amount was accrued in Eni’s Consolidated Financial Statements in a previous reporting period and subsequently paid to the European Commission. The proceeding has been terminated. With regard to the alleged anti competitive practices in the sector of CR elastomers, in December 2012, the First Instance Court of the European Union reduced to euro 106 million the fine imposed to Eni and its subsidiary Polimeri Europa from the original amount of euro 132.16 million sanctioned on December 5, 2007. A recent sentence of the European Justice Court reaffirmed the reduced amount of the fine thus terminating this proceeding. The amount was accrued in Eni’s Consolidated Financial Statements in a previous reporting period. (ii) Eni SpA - Investigation of the Italian Authority for Electricity Gas and Water (AEEGSI) about the invoicing to retail clients of gas and electricity. With the resolution 477/2013/S/Com of October 31, 2013, the Italian AEEGSI resolved to commence a preliminary investigation to ascertain whether Eni violated certain administrative provisions that regulate the periodical invoicing in the retail selling of gas and electricity. The investigation also includes alleged delays in the invoice of certain documentation which is required in case of change of supplier. 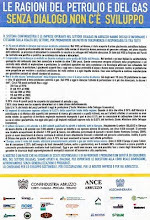 Eni filed certain proposals of commitments with the AEEGSI. In case the AEEGSI accepts those commitments, the AEEGSI would close the investigation without ascertaining any wrongdoing on part of Eni and without imposing any fine on the Company. The AEEGSI requested a market test and Eni modified its commitments in response to the AEEGSI review and suggestions from market participants. In 2014, the AEEGSI accepted Eni’s commitments and closed the investigation without formulating any charge against Eni.